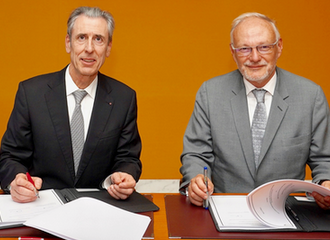 Monaco, January 15, 2019 - Investisseurs & Partenaires (I&P) and the Government of Monaco signed a partnership agreement to create the first impact fund dedicated to education in Africa. Launched by 2020, its objective will be to address the challenges of access, equity, quality and adequacy of education in Africa. Photo: M. Gilles Tonelli, Minister of Foreign Affairs and Cooperation et M. Jean-Michel Severino, CEO of Investisseurs & Partenaires. © Direction de la Communication/Mikael Alesi. Investisseurs & Partenaires is an impact investing group fully dedicated to small and medium enterprises in Sub-Saharan Africa, with the firm conviction that these enterprises actively contribute to sustainable and inclusive growth on the continent. Since its launch in 2002, I&P has supported about 90 small and medium enterprises based in 16 Sub-Saharan African countries. These companies create local value and sustainable jobs, but also generate significant social, environmental and governance impacts.